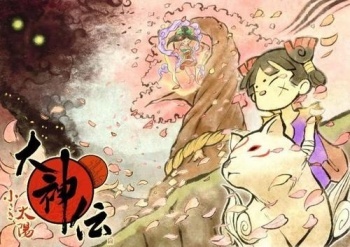 Okamiden, the DS sequel to the cult hit Okami, has been trademarked in North America and Europe - suggesting that Capcom is planning on bringing the title overseas. Everyone say it with me now: "PUPPY!" When Okamiden, the DS sequel to 2006's beloved Okami, was announced back in September, everyone who'd bought the original game (yes, all 26 of them) stood up in a collective shout of "Yes!" and "Awww, lookit the little baby wolf-goddess!" Then, they promptly sat back down again, as they realized that Capcom might not be planning to localize the title - heavily steeped in Japanese culture and folklore - at all. Well, this may not be a confirmation, but you can breathe a little bit easier now: Siliconera has unearthed Capcom trademarks for Okamiden in both Europe and North America, meaning that - at the very least - somebody is talking about bringing the DS platformer and its adorable protagonist Chibiterasu to the Western shores. But when you think about this, it really makes sense. If Capcom localized freaking Tatsunoko vs. Capcom, these guys will localize anything! I want to hug Chibiterasu. I really, really do. Oh man i hope it makes a release stateside. im a sucker for Japanese Art, Mythology, and good Story. Have you ever played The World Ends With You? Best game on DS in my humble opinion. Oh, and do play the first Okami. It's one of the best games ever made. Great. I can's wait to play it. And Chibiterasu is pretty cute, I suppose. CHIBITERASUUUUUUUU! This may be the best day of the year so far. What I mean to say is that bringing a new entry in the Okami franchise to the DS makes perfect sense, given the stylus and touch screen, so I hope this makes it to North America. Time to dust of the D.S I need this. They'd be fools if they didn't release it here. The amount of crap we get on the DS here is unbelievable. We could do with some more decent DS games. Chibis, in my honest opinion, tend to be sickeningly cute, making me want to gag. I make an exception to Chibi Ammy. Because this is awesome news! I am going to buy a DS purely for this game. Hell yes this is great news! Now my monitor is broken! Yes, practical considerations have a nice way of derailing idealized fantasies, don't they? You won't need a monitor, Okamiden owns you now... Wait, if you're monitor's broken, you won't be able to read this. OT: Never played the first one, but im definitely gonna give this one a look. Buying first day. This is getting my support. Agreed, companies that make games like these deserve every bit of support. Okami for the Wii was awesome! It's too bad I don't have a DS. Still gonna buy, but seriously why the DS? With exceptions for a few, I hate 3D games on the DS. hy not the Wii or PS2? I'm I the only one of the 26 who doesn't care for this game? I mean, I'm normally a cat person, but... I bought Okami on the Wii (too little too late to save Clover, I'm ashamed). This is a must. Probably. I don't see any reason why anyone who played Okami wouldn't want more Okami, ignoring insanity. I really wish I could play Okami.. It looks like the type of game i'd like. Because there isn't a console better for the paint controls than the DS. The wii comes close, but it's still not as precise as actually drawing straight on the screen. The PS2 doesn't come close. This is great, I wonder if they're going to change the content for the worse though to adapt it for the western speaking market? One of the biggest must-buys of 2011.